Melissa is sitting at a table, rubbing her eyes, when Josh comes in. He asks her if she's still having trouble and she replies that the optometrist says they're fine. Josh says he knows what's wrong with her – he has to do a little bit more research, but he should know more this afternoon. Melissa then asks if he knows where Cody is. Josh sighs that she and Todd have run away; they've taken off. Melissa asks in concern if they're hitching. Josh says he doesn't know. Melissa asks Josh if he knows where they've gone. Josh replies that Cody said she has a friend somewhere – but she and Todd made him promise not to tell anyone. Jim is talking on the ‘phone as Doug paces the floor. Jim hangs up in frustration and tells Doug that they won't give out details of bus passengers without police authorisation. Doug comments that's the next step, then. Jim, however, says he doesn't want to involve the police. He decides to go and see Josh and Melissa before school starts – but adds that if they don't know anything, he'll call Sergeant Mooney. 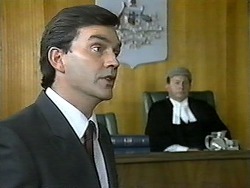 The Court Officer orders the court to rise, and everyone stands up as Judge Latimer enters and takes his seat. 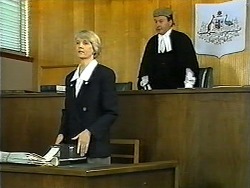 The Court Officer then announces that the court is in session. 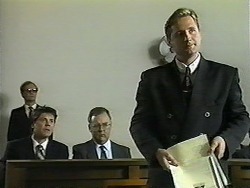 The judge outlines the case and then suggests that they begin at the beginning. Joe's lawyer – Stephen Evans – stands and holds out some sheets of paper, saying he presents these affidavits as to the good character of his client. 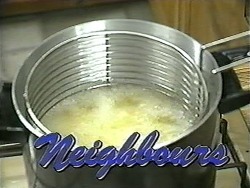 He goes on that it's his intention to demonstrate that Joe Mangel is the best person to care for Sky Bishop. Joe is sitting next to Harold, listening as his lawyer continues addressing the judge. Melissa and Josh are about to leave the Coffee Shop when Jim comes in and tells them curtly that he wants a word with them. He asks if they've seen Todd today. Josh says he'll be seeing him next period, but Jim retorts that they've run away – if they didn't already know that… Josh makes a quick dash for the door, saying he'll be late for Maths. Melissa isn't so quick, though, and asks Jim what will happen if they send Todd to a Youth Training Centre. Jim says that won't happen if they get to him first. Melissa snaps that she doesn't know anything, and she storms out. 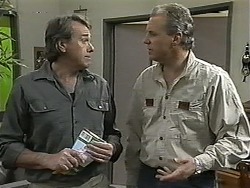 ERIC: Well you see, although Kerry and I were travelling through Europe together when she became pregnant, we'd already decided to go our separate ways. MR. LEWIS: Would you have stayed with her if you could? ERIC: Look, Kerry thought it was wrong to stay together because of the child, and I agreed. 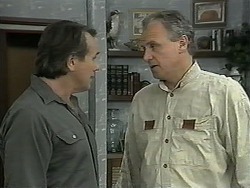 Joe mutters to Harold that that's a load of bull. Harold whispers to him to be quiet. Eric goes on that he wants to make up for lost time; he wants Sky to live with *him*. Josh packs some books away as Melissa walks in. She snaps that Mr. Robinson gave her the first degree this morning. She tries to get Josh to tell Jim what he knows, but Josh tells her testily to just drop it. JOSH: The thing is… I didn't want to tell you because Todd made me promise… And then Melissa got on my goat so I said I'd come. I don't know if I'm doing the right thing. He hesitates before continuing that Todd came to see him last night and said they were going to hitchhike north – up along the highway; they reckoned they could pick up work. He adds that Cody said she had a friend, but she didn't say where. Jim thanks Josh, saying he knows it's been hard. 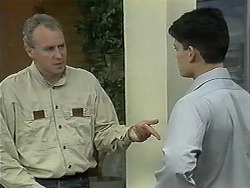 Josh pleads with Jim not to let Todd know he dobbed him in. 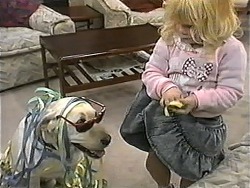 In the lounge room, Sky has dressed Bouncer in ribbons and sunglasses! Toby comes in and tells the dog that he looks like a real sissy! 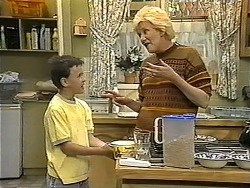 He then runs into the kitchen and asks Madge if his dad is home from court yet. Madge, however, sighs sadly that it'll take more than one day to sort this out. She adds that they have to pull together and get his dad through this. ERIC: When I saw Kerry again, I was happy to leave Sky in her care. She was a good mother and Sky was obviously well cared- for – and I thought if I had access to Sky, well, it would compensate for my wife and I not being able to have kids of our own. But after Kerry died, things have changed. I don't want my daughter brought up by someone who has no blood ties with her. Joe Mangel is not her real father and he never will be. Joe grits his teeth and mutters at Harold that Sky is *his* kid. 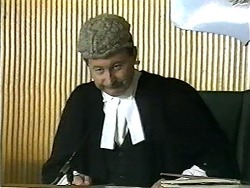 The judge tells Eric that he may step down. He then suggests they take a break. The Court Officer tells everyone to rise and announces that the court is in recess and will resume at two o'clock. Sky is on the kitchen floor, still teasing Bouncer! 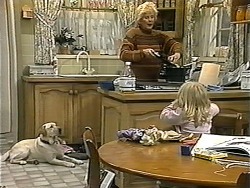 Madge lifts her up and puts her at the kitchen table in front of a sandwich. She then smiles that she thinks Sky would like chips, wouldn't she! Josh walks into the Coffee Shop and Melissa immediately tells him to guess what Debbie Langford spread all over school. Josh says he knows: Todd and Cody have run away because Cody's in trouble. He changes the subject and tells Melissa that he has some good news: he's worked out what's wrong with her. He goes on that he looked in the medical encyclopaedia to check some of the side effects of the drugs she takes for her epilepsy, but it was inconclusive, so he spoke to the chemist next to their newsagency, who lent him a book, and it looks as though she's developed a tolerance to her drugs and has been having mini attacks of epilepsy. Melissa asks excitedly if that means that if the doctor prescribes some new drugs, she'll be all right! She kisses him happily! Jim and Doug are poring over a map, trying to work out where Todd and Cody would have gone. Doug says he thinks they'll have headed for Miranda – Cody's friend's – place. Jim suggests giving her a call, but Doug says he doesn't want to tip her off that they're in the know. He decides to drive up there. Jim says he'll go too, but Doug insists that he wants to bring Todd home in one piece – which Todd might not be if Jim's there! Joe, Harold and Stephen Evans walk into the Coffee Shop, Joe complaining bitterly about the way things went in court and how Eric has money that talks. 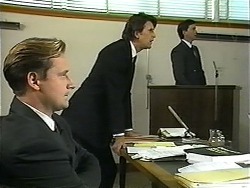 The three of them sit down and Evans tells Joe that he has no reason to be pessimistic: the judge knows how easy it is to find an expert to back up any view – and the sympathy of the court is still in Joe's favour. Joe growls that this is his little girl they're talking about here. Evans tells him that if Joe's testimony goes well tomorrow, they have a good chance. Joe doesn't look happy.